By combining Smart Contracts with automated payments, TessPay is now able to guarantee daily transactions will be made in full. That means you get paid on time – every time. The TessPay system offers liquidity that allows lender funding, payment assurance, fraud mitigation and secure transparency throughout each step of every transaction. Smart Contracts create a much-needed shift in the processing of settlements for wholesale traffic between international carriers. That means you can spend time building your business and not chasing money. Major Carriers deal directly with the public and whereas the Smaller Carriers have more limited dealings with the public and often deal mainly with each other. Dealings between telecommunications carriers are often referred to as “Wholesale Telecom”. A significant activity of the Wholesale Telecom industry consists of placing long-distance voice calls between parties in widely separated geographies. In the past, these long-distance calls were often only effected between national telecom carriers or highly regulated Major Carriers through satellite link or submarine communications cables. In more recent times these calls have been effected using Voice Over Internet Protocol (VOIP) technology, which has afforded Smaller Carriers the opportunity to participate in long distance voice transmissions. The Wholesale Telecom business supported by VOIP technology tends to be a high volume low margin activity. Volumes are measured in minutes and currently aggregate a trillion minutes on an annual basis. Telecommunications industry revenue associated with cross border voice calls is estimated at $60 billion and is believed to be growing at 10% annually. Major Carriers generally won’t extend significant credit to Smaller Carriers but expect to be granted credit on 30/30 terms. Smaller Carriers will extend credit to each other on a case by case basis, but this is an uneven process and is subject to the difficulty of confirming another Small Carriers legitimacy, communications quality and their trustworthiness for payments. Additionally, Smaller Carriers face difficulty in obtaining credit to operate their Wholesale Telecom business. Whereas Major Carriers are highly trusted financially sound parties and, consequently, obtain credit in the ordinary course of business without difficulty, Smaller Carriers often have difficulty obtaining lender credit, which can further constrain their dealings among one another. Carriers with low creditworthiness unable to support credit terms to finance major carrier payment terms. Endemic late payments that make cash flow difficult to manage. Carriers operating on low margins (as low as 2%) and minimal capital present a bankruptcy risk. Defaults on payments resulting from low capitalization and fraud cause the loss of tens of millions of dollars — losses that insurance is not always able to fully recoup. A Small Carrier fails to pay another Small Carrier for minutes used to complete a long-distance call with another Small Carrier. This can have major consequences for the unpaid Small Carrier. Expanding on that, a default by one cross-border Small Carrier a level or two up in the chain on any one long distance call can reverberate downstream with adverse consequences for those extending credit down the line. Credit losses can seriously harm a Smaller Carrier’s cash flow, profitability, solvency and, in extreme cases, viability. Most transactions between Smaller Carriers are international with another Smaller Carrier in a foreign jurisdiction, making financial risk assessment difficult, time consuming and expensive. Our solution is designed to encourage the industry to adopt a lender funded pre-payment business model assuring all parties to a cross-border voice call can expect payment within terms including of repayment of lender financed Small Carrier transactions. 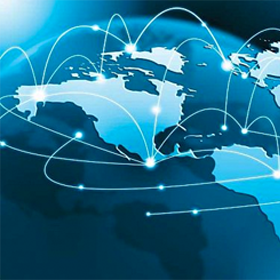 Under the TessPay solution each of the parties to a cross-border call, excepting the Major Carrier, will prepay in an escrow account, the next party down the call chain of Small Carriers and ultimately the receiving Major Carrier, for long distance minutes purchased from the other Small Carriers. Credit and collection issues that accompany the present approach to settling transaction values in successive layers of the voice call will be eliminated. The Small Carrier dealing with the Major Carrier will grant that the Major Carrier credit on normal 30/30 terms for minutes sold to the Major Carrier and rely on a lender, as required, to fund the payment it will, in turn, make to the next Small Carrier down the call chain for purchased minutes. Transactions between the carriers will occur in escrow using TessPay Smart Contracts and settlement prepayments will be made using fiat currency held within TessPay Multi-Currency Wallets, which will be attached to the TessPay Smart Contracts. Fiat currency funds placed on deposit for TessPay Smart Contracts will be held by a major international bank, known as the “Depository”. Once a TessPay Smart Contract has been signed by both parties it will be eligible for funding. Funding can occur either by the Small Carrier allocating funds from its TessPay Multi-Currency Wallet to the Smart Contract or accessing prearranged funds from its lender or soliciting funds from a third-party lender via a Funding Board maintained by TessPay. At the end of each 24-hour period, after the Major Carrier has consumed minutes purchased in accordance with terms of the TessPay Smart Contract all the participants in the call chain will see a release of fiat currency into their TessPay Multi-Currency Wallets pursuant to the terms of their TessPay Smart Contracts. The Small Carriers will have allocated fiat balances available in their TessPay Multi-Currency Wallets to enter into new TessPay Smart Contracts or request a withdrawal by bank wire transfer from the Depository. The Major Carrier will not use a TessPay Multi-Currency Wallet. On the due date of the 30/30 contract, the Major Carrier will pay its invoice due the first Smaller Carrier in the chain using fiat currency as it does at present, with one exception. The payment will be made to the Depository referencing the TessPay Smart Contract ID. The obligations of the Major Carrier will not change. 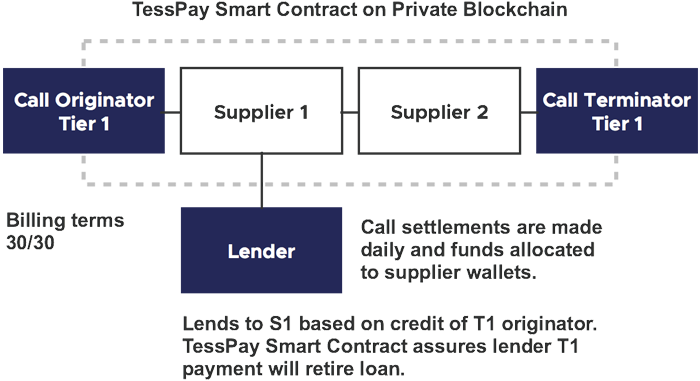 Embedded immutable payment instructions in the TessPay Smart Contract will assure all Small Carriers in the call chain and their lenders alike that the funds remitted by the Major Carrier will go to the Depository and be allocated to TessPay Multi-Currency Wallets. Invoices will be issued automatically as per the terms of the TessPay Smart Contracts and payment disputes between Small Carriers will be largely eliminated. TessPay will maintain the code list ORACLE and will operate pass-through switching CDR verification service with associated reporting to ensure that all parties in the cross-border voice call chain is secured. However, TessPay will have neither visibility with respect to the parties to the carriers’ contracts nor the rates charged for the calls that go through the CDR verification pass-through switch. TessPay Smart Contracts will ensure the privacy of all parties in the call chain. Receipt of the Major Carrier’s payment by the Depository will be a triggering event that initiates the transfer of fiat currency within the TessPay Multi-Currency Wallets to the lender and Small Carriers, allowing them to either fund new TessPay Smart Contracts or request a withdrawal by bank wire transfer from the Depository. TessPay Multi-Currency Wallets will be funded by Smaller Carriers (with assistance from their lenders as required) by depositing fiat currency in the Depository. TessPay Multi-Currency Wallets constitute a closed loop system. Only accredited telecommunications carriers and lenders will be eligible to use the TessPay Escrow Settlement System. This exclusionary provision should alleviate concerns regarding money laundering by unscrupulous parties. TessPay will only accept telecommunications companies previously vetted by existing regulators. TessPay service fees will be paid in fiat currency from the Smart Contract wallets. Fiat balances will attach to TessPay Smart Contracts using blockchain technology. Smart contracts are computer protocols intended to facilitate, verify or enforce the performance of legally binding contracts between two or more parties. Smart contracts run on blockchain node networks beyond the control of the parties to the contracts, assuring the contracts will be executed as written once performance begins. TessPay Smart Contracts will operate on a private permissioned Hyperledger Fabric 1 blockchain. Hyperledger Fabric 1 is a blockchain framework implementation, hosted by The Linux Foundation. The TessPay blockchain will be constructed in concert with IBM, one of the major contributors to the Hyperledger project. The network will be highly scalable with consensus and integrity securely maintained by nodes, operated, in many cases, by Major Carriers as part of their technology infrastructure. The objective of a smart contract is to provide security over execution of the terms of a contract that is superior to and less costly than conventionally monitored adherence to legal agreements. From a financial perspective, the advantages of a smart contract include minimized counterparty risk, almost instantaneous settlement times and increased transparency. In effect, payment streams can be securely automated to the benefit of all the transacting parties. TessPay Smart Contracts will define: invoice date and interval; payment terms; rates; billing increments; code list; payment coordinates; authorized IP’s; protocols, CODEC’s, etc. TessPay will enter into an agreement with a recognized international bank to operate as a fiduciary to hold fiat currency funds remitted by lenders and accredited telecommunications companies when making deposits to TessPay Multi-Currency Wallets. Such funds may only be withdrawn by lenders and accredited telecommunications companies upon the surrender of fiat balances held within TessPay Multi-Currency Wallets received by them pursuant to one or more TessPay Smart Contracts. Transactions with the Depository are anticipated to take place by wire transfer. For transfers out of the Depository, funds will be received within one business day of receipt of the transfer request. The only charges to be incurred by the telecommunications company will be the pass-through wire fee from the bank. Fiat currency balances held within TessPay Multi-Currency Wallets constitute a closed loop special purpose system. As noted, the fiat balances may only be used by lenders and accredited telecommunications companies for purpose of prepaying minutes under cross border Wholesale Telecom contracts. TessPay’s service fees will also be settled in fiat currency. TessPay will extract its service fees from fiat balances in multi-currency wallets when minute transactions settle in accordance with the provisions of TessPay Smart Contracts.